In the early morning on April 11th the Full Pink Moon will take the sky. To celebrate Spring and her first full moon, you’re invited to join our Facebook live meditation the evening of the 12th where we’ll call-in our fertile spring blessings. Join us here! The Full Pink Moon is named after the wild pink phlox flowers that covered the earth in the springtime. But don’t expect to look up and see a rosey orb around the moon (it’s not literally going to be pink), rather look to the earth for the first colourful blossoms of spring. The Pink Moon is the first full moon after the Spring Equinox, so its appearance in our sky is an invitation to celebrate the rebirth and renewal of the changing season. With spring we welcome Ostara, maiden goddess of fertility and new beginnings. Ostara is also called Eostre (meaning Eastern Star) and is often referred to as the Goddess of Dawn, since she brings the dawn from the East. Ostara’s responsibility is to banish winter by bringing spring to the earth each year. The Easter holiday also gets its name from her and has borrowed her symbols of the egg and the hare for its traditions. Pagans celebrate Ostara by leaving something sweet, like honey or candy, on their altars, to symbolize the sweetness of the nectar offered by the spring flowers she brings. Undoubtedly, the modern tradition of the sweets-filled Easter basket comes from this ritual. Ostara is the ultimate ‘luscious lady.’ In fact, the juiciest of female hormones, estrogen, is rumoured to be named after her! She embodies fertility, potential, and new life. Her arrival invites us to plant seeds in all areas of our lives, preparing for the promise of growth and opportunity after the hibernation of winter. Now is the time to connect your feet with the earth. Go for a walk in nature and seek out the delicate spring flowers peeking through the last remains of winter. Get your hands dirty, and feel the buzzing and liveliness in the soil. Plant seeds to represent new projects and goals in your life. Buy yourself flowers, or bring flowers to a friend and watch the delight in her eyes. Make a small offering to a tree — they love receiving our gifts and prayers! As you bathe in the light of the Pink Moon, let it wash its cleansing energy over you, refreshing and revitalizing you, and allowing you to let go of what no longer serves you. Among the lushness of blooming flowers and greening trees, joy and abundance also blossom. May Ostara bring you renewed energy and fertile blessings this spring! 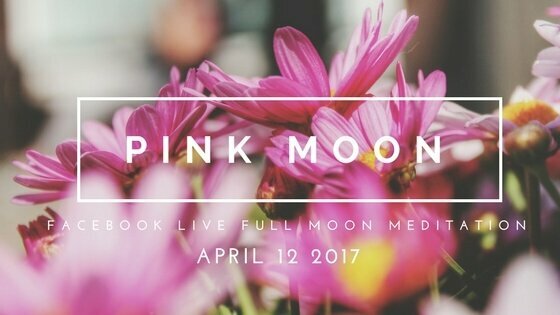 Tune in with me live on Facebook April 12th to meditate with April’s Pink Moon. We will gather together virtually to invite wondrous spring magic into our lives! Click here for details.